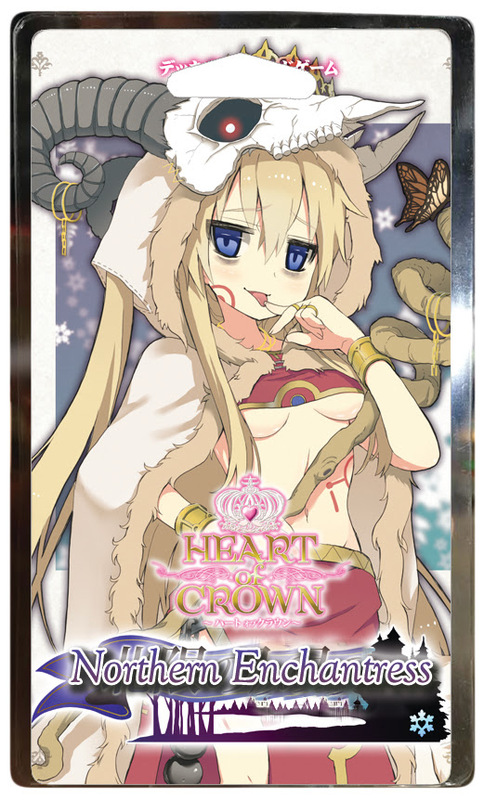 Heart of Crown: Northern Enchantress is an expansion for Heart of Crown by ginkgo, published by Japanime Games. It is for 2-4 players. This expansion adds a new princess and 13 new types of cards to be used with the base game. It also comes with randomizer cards and dividers so that it can be placed in the box along with the other cards. For more information on the original Heart of Crowns game, please check out the link below. For those unfamiliar with Heart of Crown, let me give you a quick overview of the game. The game is played over several round with each player starting the game with 7 Farming Villages and 3 Apprentice Maids in their deck. A Basic Market and Random Market are set up with various card types. The Basic Market contains City, Large City, Royal Maid, Senator and Duke cards, while the Random Market contains 10 different common card types shuffled together into a deck. 8 different card types are then set around the deck. The players draw 5 cards for their starting hand. On the player’s turn, they will follow 5 phases. In these phases, they will be able to play an Action or Territory card. If it has link symbols on it, they can play more. They can then buy card from the market, back a Princess or play Succession card to their Domain in front of themself. Of course that’s after they chosen a Princess to back. Once a player backs a Princess, they’ll be able to do more stuff like placing cards on top of Territory cards in their Domain to keep them available for later. Once they’ve done all that they want or are able to do, they clean up everything they’ve played that’s not in their Domain and draw 5 new cards. The Market refreshes any empty slots that were emptied during the player’s turn and play passes to the next player. All this continues until one player ends up with 20 Succession points in their Domain. As long as there’s no other players able to do that on their turns, that player wins. Otherwise the tied players continue to 30 Succession points. Now that you have a basic understanding of the game and how it works, what does this expansion add as far as content? Well, to begin with there’s a new Princess to be thrown into the mix. She’s added in with all the other Princesses at the beginning of the game, putting the count now up to 14 Princess cards, if you choose to use the one from the Far East Territory expansion as well. There are also 13 new types of Common cards that are used in the usual manner in the Supply. These are mixed in either small or large doses with these market cards to add new choices and combos for the players to make. The expansion contains a list of recommended card sets for customizing the game by using certain Common cards from this set along with the core set by itself, or by adding in cards from the Far East Territory set as well. These cards add a touch of magic, as well as adding some non human races to the game. There are elves, dwarves and even cait sith. I’ll go into a little bit more detail in the gameplay section below. The only real components that this expansion provides is a deck of cards and a few dividers so that the cards can be placed into the main game box. That said, what it actually adds is more than that. There’s the new Princess card that adds a touch of magic to the mix. There’s also 13 new types of Common Cards. These add lots of new actions, some magic and even a new way way to gain some Succession points. The artwork and designs fit in well with the other cards of the main game and other expansion. I really like the overall look and feel of everything. Once again, the quality of the cards is quite high. I’m very pleased with everything that comes with this expansion. Of course, it fits in the main box with the other expansion with plenty of room to spare. Great job. The rulebook for this expansion is a rather small, card size booklet. There are no pictures other than the one on the cover. There’s a brief story about the Northern Limit Territory included in the book, which I feel is a nice addition. The rulebook itself doesn’t contain a lot of rules. Instead it explains how to add this expansion to the main game and the other expansion, as well as give you several clarifications for most of the cards. There’s a fairly large section devoted to frequently asked questions arranged by card name. Each FAQ gives a bit more insight into how each particular card works. It also includes 9 different lists of recommended card sets for playing the game with. There are sets for using this with just the base game, as well as for the base game and the Far East Territory set. Each recommended set provides a different way of playing the game. Just like with the Far East Territory expansion, I really would have liked more pictures and examples of gameplay in the rulebook, but sometimes smaller is better. I get it. Overall, the book is good, despite the lack of pictures and examples. I like this expansion a good bit more than the previous one. Perhaps that’s because we have elves in this expansion, or it could be that there’s even more cards in this one. However it’s more likely because there are lots of ways to draw cards and spend coins in this one. I’m all about drawing more cards to my hand, and this expansion does just that. This one adds a new territory in the Industrial City. It allows you to gain 2 coins and draw a card. Unfortunately it only has one link on it, but that’s ok. Combine it with the Port City from the last expansion and they pay for each other. Like I said earlier, there are lots of actions in this expansion. There’s the Famed Horse that allows you to discard a card to draw 2 cards and the Lucky Piece that lets you choose between gaining a coin, drawing a card or banishing a curse card from your hand. That’s pretty good as this expansion adds a new curse card to the mix; the Cursed Doll. Unfortunately she can’t be banished so the Lucky Piece isn’t so great against her. Instead when the player buys the doll, it goes into the player to their left’s hand instead. Basically this cards clogs up your deck unless when she’s in your hand you’re willing to pay 2 coins to pass her to the player on your left. It’s quite a nuisance. As I said before, this one also adds a new Succession card; the Noble Heiress. This one gives you 5 Succession points. However she can’t be bought if you played a Farming Village during your turn and she can’t be acquired through a card effect. You either buy her or you don’t get her. Of course, there’s plenty of ways to get extra coins as you’ve already seen. Overall, I really like the way the game plays with these new additions. I think fans of the original game will like that about his expansion too and will want to add this to their collection. In my opinion it’s even more of a must buy then the previous expansion. I highly recommend it. Heart of Crown: Northern Enchantress is an expansion for Heart of Crown. It adds a new Princess and 65 new Common Cards in 13 different types to be used with the supply. These cards focus on magic and non human races like elves, dwarves and cait sith. The expansion doesn’t add any more to the play time of the game. Most game sessions still last around 45 minutes or so. The cards are really great. My daughter and I enjoy the anime style on these a bit more than we did the ones from the Far East Territory. I especially like the Elven Sniper. My daughter, of course, likes the new princess and the Noble Heiress. This expansion adds a lot more to an already great game making it even more replayable than before. It works great with just the main game, as well as adding in the Far East Territory expansion too. Fans of Heart of Crown will love this, even more than the first expansion. For me and other Heart of Crown owners, it’s a must have. I highly recommend it. 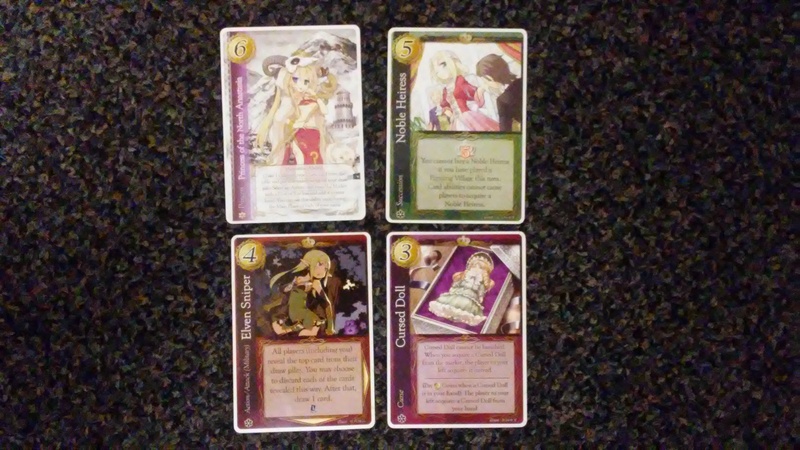 This entry was posted in Reviews and tagged board, board games, card, card games, crown, enchantress, games, gingko, heart, heart of crown, japanime, japanime games, northern, northern enchantress. Bookmark the permalink.